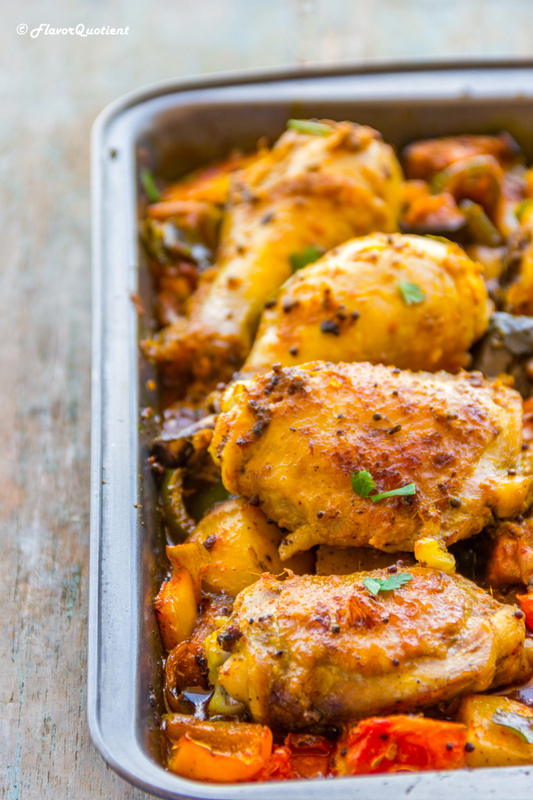 Today’s recipe of Indian spiced tray baked chicken and veggies is a wholesome one-pot wonder. It has the right balance of nutrition and amazing flavors which will be loved by all in the family! Baked chicken is my favorite genre of food (if it’s legit to call a genre!) and there is no stopping to it since the time I had got my oven… almost 2 years back! Oven-cooked chicken has something extra in it which always keeps me hooked and I keep on trying new recipes one after another. 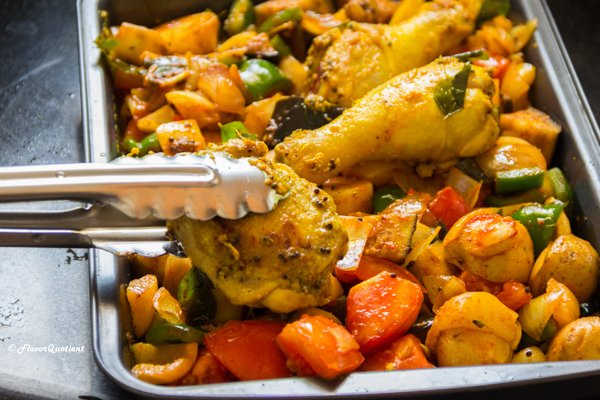 Today’s recipe of Indian spiced tray baked chicken with veggies is an example of another such successful experiment. This recipe is very different from what I had tried so far. 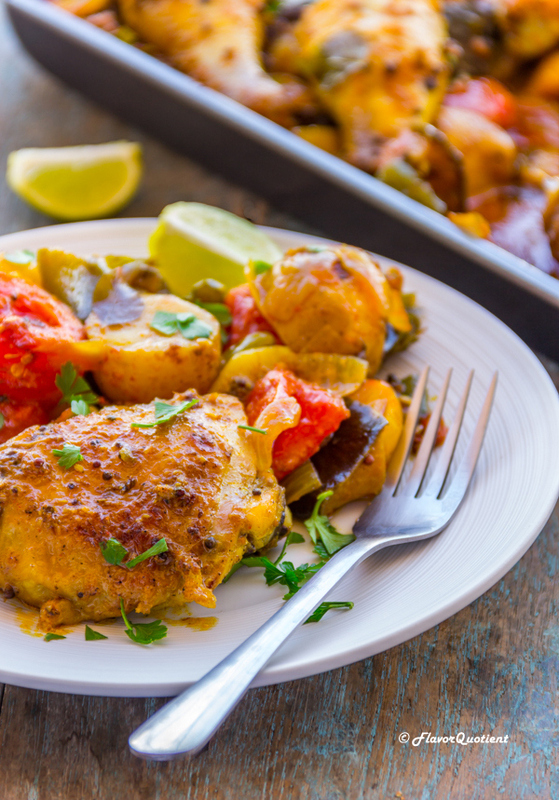 Baked chicken with potatoes is something we do frequently but chicken with eggplant? That’s new! And I am always game for such new things which is why I could successfully create this spectacular dish at my own tiny kitchen and discovered some different yet amazing combination of flavors! 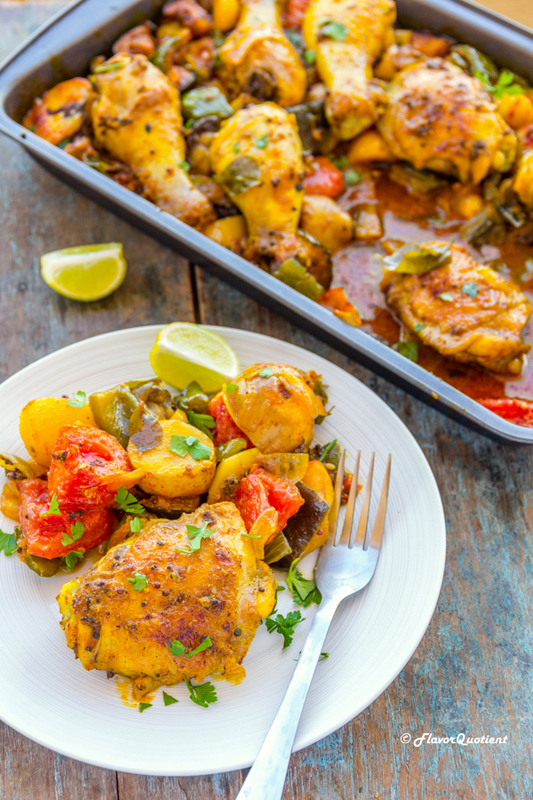 Indian spiced tray baked chicken with veggies is really a spectacular dish for a reason. Because of all the veggies, this dish turns out so spectacularly colorful that it will perk you up instantly. 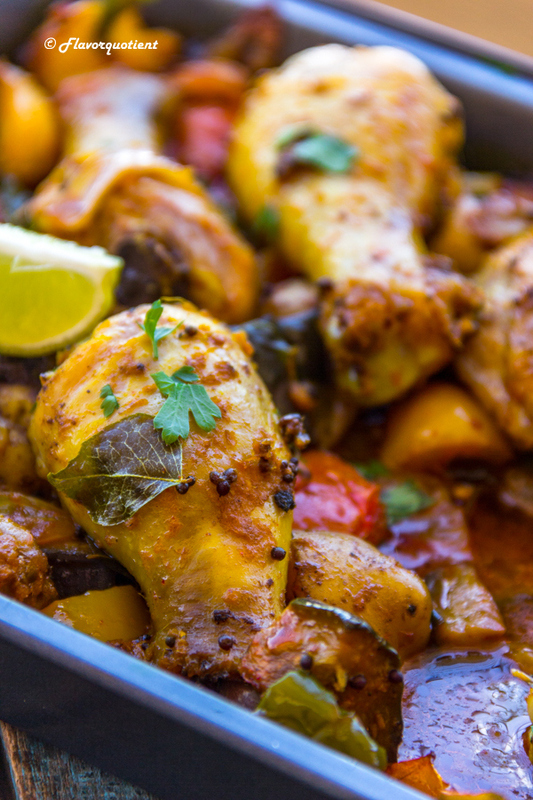 With the added aroma from the Indian spices, I bet you can’t not feel hungry as soon as you come in contact with it no matter how heavy or light your last meal was. The chicken in this dish is crispy on the outside thanks to the skin and succulent on the inside infused with all good flavors. 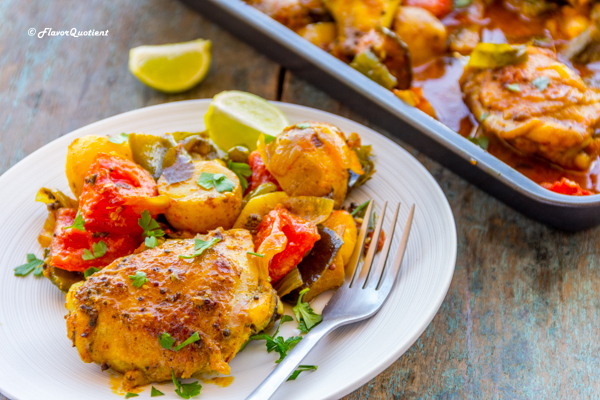 And this perfect chicken is perfectly accompanied by loads of veggies which not only add extra crunch to the dish but also increases the nutrition level immensely without much of an effort. If you cook for kids, this would be an ideal recipe for you where you can hide veggies for your little picky eaters. First week of new year has already passed and I am still wondering how time could be so fast! It feels like yesterday when we had a nice family gathering on my birthday which falls on last but one day of the year. And here I am today, spending the second weekend of the year inside my cozy blanket and craving for some hot chicken stew to soothe my sore throat. There is so much to do but so little time! Isn’t it UNFAIR? Well, I am old enough now to understand that life is not fair to anyone until and unless you take charge of it. So, there is no point in arguing with something as abstract as life and I better take charge of the tasks at hand. Thankfully my today’s task is pretty simple and I guess I am successfully wrapping it up. 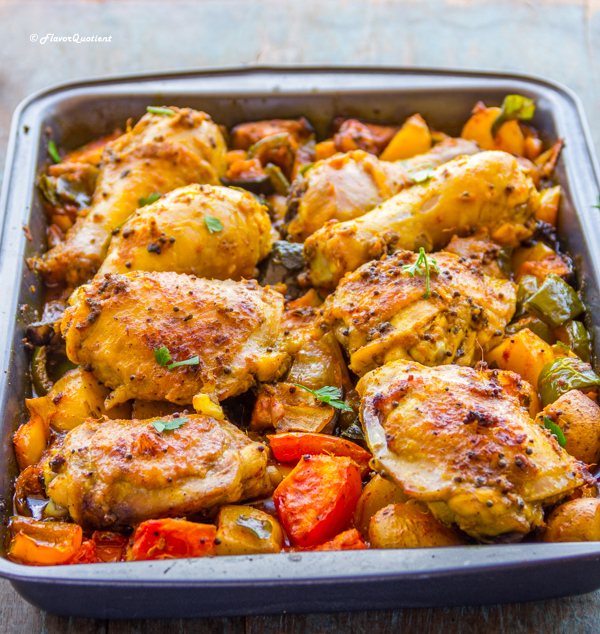 This recipe of Indian spiced tray baked chicken with veggies is outstanding enough to make you crave for it on its own without me giving too much effort! I would only add that it is childishly easy to make and you won’t have to recall a whole list of spices just because it is Indian spiced; you would only need 3 things – turmeric, mustard seeds and curry leaves – to create this incredible delicacy at home. 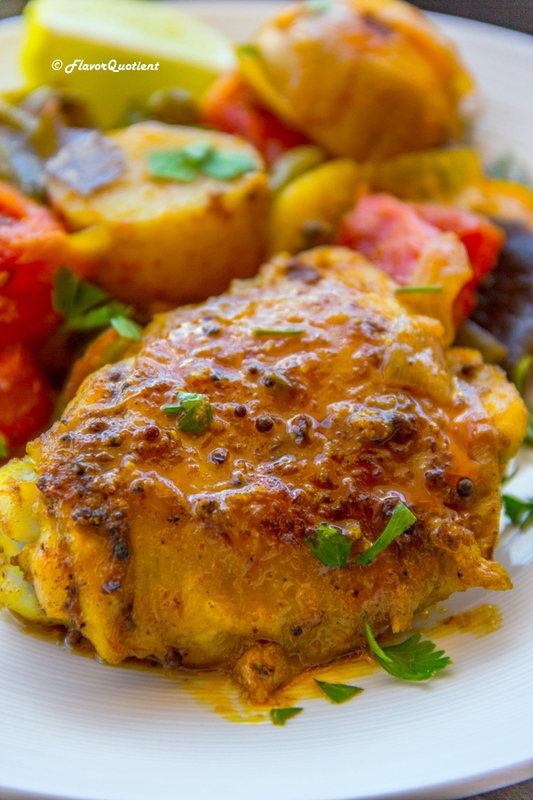 This recipe of Indian spiced tray baked chicken with veggies is adopted from Jamie Oliver’s recipe in his Food Tube channel. When I first discovered it, baked chicken had already won me; on top of it the ‘Indian spiced’ factor had me bowled over. Initially I was surprised to see eggplant with chicken as it is not a common combination in Indian cuisine; but I had my trust on Jamie and thank God I did! It is indeed a different recipe but what fun in cooking if you don’t experiment! If you too love to cook as much as I do, you will surely agree with me that such experiments are the real fun of cooking and when they turn out to be as successful as today’s recipe, you just feel out of the world! Am I not correct? 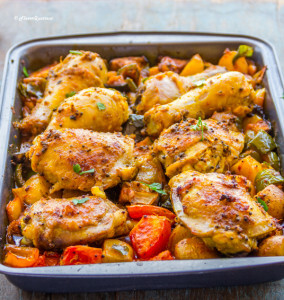 You can add more experimental elements into this and make it your own signature dish; nevertheless this Indian spiced tray baked chicken with veggies is definitely going to be a showstopper every time you serve it to your friends and family! Wash the potatoes really well making sure no dirt is left behind as we are not going to peel them; keeping the skin on will add extra crunch to the dish. Cut the potatoes into 1 inch cubes. Bring a pot of salted water to boil and add the potato cubes to it. Let it cook for 5 minutes and then drain and set aside. Prepare the other veggies – cut the eggplant into 1 inch cubes. Cut the bell peppers, onions and tomatoes too into 1 inch cubes. Chop the green chillies finely. Preheat your oven to 190 C / 375 F and place the wire rack at lowest level of the oven. In a large skillet, add the vegetable oil. Once oil is hot, add mustard seeds and curry leaves. Let them crackle. Then add the chopped ginger and minced garlic and sauté for 30 seconds. Then goes the turmeric powder and give a good stir. Now add the chicken pieces keeping skin side down. Sprinkle salt and pepper on top. Let the chicken braise for 5 to 8 minutes on medium heat. Take the chicken pieces out and set them aside on a plate. To the same skillet, add all the prepared veggies – eggplant, peppers, onions, tomatoes, green chillies and also boiled potatoes. Stir them to give a good mix. Season with salt and pepper to taste. Sauté them on medium flame for 5 minutes. Now transfer all the sautéed veggies to a large baking dish along with all the spices (it must be big enough to hold all veggies and chicken together). Spread the veggies evenly all over the baking dish. Return the braised chicken pieces on top of the veggies keeping the skin side up this time. Drizzle some oil on top. Bake the chicken and veggies in the preheated oven for 45 minutes to 1 hour or until the chicken is cooked through. The internal temperature of thickest part of the chicken must register 170 F in an instant read thermometer. Sprinkle some fresh coriander leaves and serve the tray baked chicken and veggies with a drizzle of mint-yogurt chutney.